22nd match of ICC Worldcup 2015 has been played between England and Sri Lanka at Westpac Stadium, Wellington today. After winning toss England put huge score of 309 runs for Sri Lanka. Sri Lanka in reply chased successfully the given target in 47.2 overs with 9 wickets remainings. Top orders HDRL Thirimanne 139* and brillient KC Sangakkara 117* runs lifted possible win from England with superb batting preformances. Earlier, England won the toss and decided to bat first on a batting pitch. England made good start with MM Ali and IR Bell initially. Suddenly lost 2 wickets quickly and England were in trouble. JE Root took the charge in hand and played superb inning of 121 runs of 108 balls and England managed to put huge score of 309 runs for Sri Lanka to achieved. Following huge target of 310 runs, Sri Lanka made perfact start with HDRL Thirimanne and TM Dilshan. Both added 100 runs for 1st wicket before TM Dilshan lost his wicket scoring 44 runs. KC Sangakkara joined with Thirimanne and played quick cricket. Both played splendid cricket and gave Sri Lanka comprehensive win in 47.2 overs with 9 wickets. 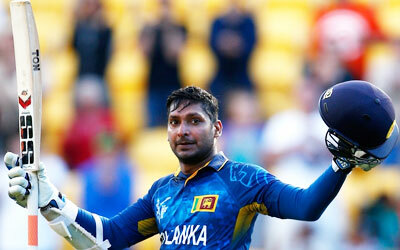 KC Sangakkara made 117* runs and HDRL Thirimanne contributed very well 139* runs and remained not out till end.